Regional threat: The Islamic State in Iraq and Syria (ISIS), a designated terror group, is in a position to overthrow the governments of Iraq and Syria and perhaps beyond, starting with Jordan. Straddling the Iraq-Syria frontier, it may both erase the nearly century-old border between these two colonial creations and end their existence as unitary states, thereby overturning the Middle Eastern political order as it emerged from World War I. Rightly does the U.S. government call ISIS "a threat to the entire region." Unexpected strength: These developments establish that the most extreme and violent form of Islamism, as represented by al-Qaeda and like groups, can go beyond terrorism to form guerrilla militias that conquer territory and challenge governments. In this, ISIS joins the Taliban in Afghanistan, Al-Shabaab in Somalia, Al-Nusra Front in Syria, Ansar Dine in Mali, and Boko Haram in Nigeria. Muslims hate Islamism: Thanks to the ferocious reputation ISIS has established in its capital city of Raqqa, Syria, and elsewhere, an estimated quarter of Mosul's population of almost two million has fled. The current round of ISIS brutality will newly render Islamism obnoxious to millions more Muslims. Ultimate frustration: Therefore, however much damage the al-Qaeda-type organizations can do to property and lives, they ultimately cannot emerge victorious (meaning, a caliph applying Islamic law in its entirety and severity) because their undiluted extremism both alienates Muslims and scares non-Muslims. In the end, tactically cautious forms of Islamism (e.g., that of Fethullah Gülen in Turkey) have the greatest potential, because they appeal to a broader swath of Muslims and worry non-Muslims less. Sunnis vs. Shiites: ISIS military advances directly threaten Iraq's Shiite-dominated, pro-Iran regime. 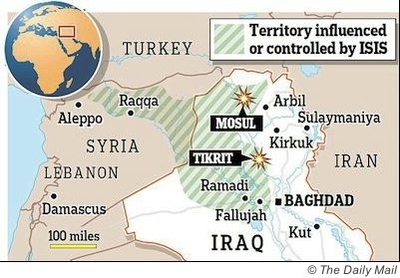 Tehran cannot allow it to go under; accordingly, Iranian forces have already helped retake Tikrit and greater Iranian involvement has been promised. This points to a replica of the ethnic lines in Syria's civil war, with Turkish-backed Sunni jihadis rebelling against an Iranian-backed Shiite-oriented central government. As in Syria, this confrontation leads to a humanitarian disaster even as it turns Islamists against each other, thereby serving Western interests. The Mosul Dam looms: In the 1980s, Saudis and other Arabs funded a poorly constructed quickie dam on the Tigris River about 35 miles northwest of Mosul. Substandard construction means it leaks and needs constant grouting and other expensive measures to avoid cataclysmic collapse. Will ISIS hotheads continue these repair works? Or might they skimp on them, thereby threatening not just Mosul but much of inhabited Iraq with catastrophic flooding? American failure: More clearly than ever, the success of ISIS forces exposes the overambitious goals of the U.S.-led invasion of Iraq (and, likewise, of Afghanistan), which cost the West thousands of lives and over a trillion dollars. The fancy façade of $53 billion in American-sponsored institutions, from failed hospitals to the Iraqi National Symphony, have been exposed as the fiasco they are. ISIS soldiers standing triumphant atop U.S.-supplied military equipment bring home the folly of once-high American hopes for "a stable, democratic, and prosperous Iraq." Republicans: Republicans unfairly blame the ISIS victories on Barack Obama. No: George W. Bush made the commitment to remake Iraq, and in 2008 he signed the Status of Forces Agreement that terminated the American military presence in Iraq at the close of 2011. For the Republican party to move forward in foreign policy, it must acknowledge these errors and learn from them, not avoid them by heaping blame on Obama. Democrats: The execution of Osama bin Laden three years ago was an important symbolic step of vengeance. But it made almost no difference operationally and it's time for Obama to stop crowing about al-Qaeda being defeated. In fact, al-Qaeda and its partners are more dangerous than ever, having moved on from terrorism to conquering territory. The well-being of Americans and others depend on this reality's being recognized and acted upon. 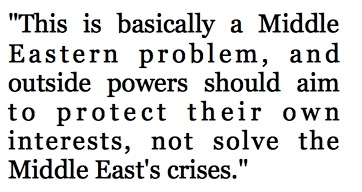 Western policy: This is basically a Middle Eastern problem, and outside powers should aim to protect their own interests, not solve the Middle East's crises. Tehran, not we, should fight ISIS.